" . . . chronicles the canine's daily life, which consists largely of jaunts around Soho with Hanne Gaby Odiele, trips on wood-paneled private jets with other furry companions, and cuddles with Christy Turlington and Karlie Kloss. Oh, and he's an activist, too." "The book, titled Neville Jacobs: I'm Marc's Dog, is set for release in September, and seems like it'll boast vast biographical scope, as it's quoted in the New York Observer as "chronicling his life 'from puppyhood to today.'" The book is "written" by Nicholas Newbold -- who'll surely be able to provide accurate documentation of Neville's life for those interested, given that he's also the manager of the dog's Instagram account -- and Marc Jacobs himself." "Though we were unable to get Neville on the phone, the dog promised to release previews of the book via social media in the weeks to come. And in case you're wondering: Yes, Choupette has already written her own magnum opus. And no word on any upcoming collaborations." "This - as his forthcoming tome entitled Neville Jacobs: I'm Marc's Dog (Rizzoli), reveals - includes such duties as hobnobbing with supermodels, collaborating with the industry's foremost creative luminaries, sampling some of the world's most elegant custom-canine separates, and globe-trotting with his master in a private jet." "Drawing on hundreds of Instagram photos of the bull terrier, from puppyhood to the present, the book captures the ins and outs of the fetching furball's glamorous life, from his many modeling gigs to off-duty downtime." "What's great about 'Neville Jacobs I'm Marc Jacobs Dog' (Rizzoli) by Neville Newbold, with a foreword by Marc Jacobs: It's a true fan book, with 240 pages of Neville. He hangs out with models like Christy Turlington, and lolls at Marc Jacobs' office. Sweet. 'Neville Jacobs I'm Marc Jacobs Dog' was originally subtitled 'The Hardest Working Dog in Fashion'. Neville Jacobs has, it is said, 171,000 followers on Instagram. Here are the images, a portfolio, and a fan book. There's tenderness, style, irony, fun, and Neville's life. He's a handsome fellow. Sales benefit The Sato Project, www.thesatoproject.com." "The book features hundreds of photographs that trace Neville's life from puppy to today, documenting his celebrity friends such as Christy Turlington-Burns and Karlie Kloss, as well as his best friend the French bulldog Choo Choo Charlie. Images include Instagram posts, editorial photo shoots and candid snapshots of Neville with Mr. Jacobs." 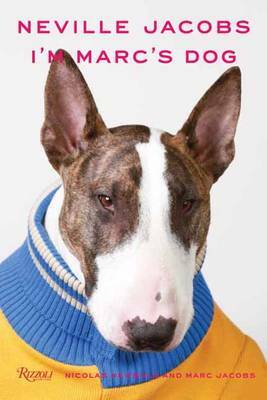 "Fortunately, fashion's most followed English Bull Terrier has now written a tell all book called Neville Jacobs: I'm Marc's Dog. It's probably the first book ever written by a dog." "Featuring highlights of Neville's life from his puppy days to now, as well as some fabulously fashion-forward friends, you can't help but love Neville as much as Jacobs, who says that Neville fills his heart with joy and calms him down like nothing or no one ever does." "This fall, Marc Jacob's charming bull terrier, Neville Jacobs, shines as the subject of his first biography, Neville Jacobs: I'm Marc's Dog . . . It's a collection of photographs documenting the life of the famous designer's pooch, and if you're a sucker for dogs, consider this your fall must-read." "While Marc Jacobs recently wrapped a successful New York Fashion Week, his famous bull terrier, Neville Jacobs is releasing his first book . . . Neville's 248-page book features 200 photos--a compilation from editorial shoots and his Instagram (which boasts 195,000 followers)." "Designer Marc Jacobs' incredibly stylish bull terrier, who boasts not one but two NYC billboard appearances, doesn't actually work in fashion, per se, but rather keeps spirits high at home and in the office. His multi-faceted role, as explained by co-owner Nick Newbold, involves patience, kindness, cuddling up with people, and, of course, being fed treats. When Neville isn't out with his colleague Choo Choo Charlie the French bulldog, he can be found napping on a floor of his choosing at the company or rummaging through garbage cans. Neville can also add "published author" to his resume, having recently released his very own book, I'm Marc's Dog." "Know someone who follows every Instagram-famous dog? They'll love this book that features Neville, a pooch that has the distinct honor of being Marc Jacobs's best pal. Carefully styled and orchestrated editorials of Neville will bring a smile to their face." "Get a glimpse into the glamorous and fashionable New York life of Neville Jacobs, Marc Jacobs' sassy bull terrier. This book is a compilation of Instagram photographs taken from puppyhood to present. Pamper your puppy-obsessed friend with a book that warms the heart and fits perfectly on a dorm room bookshelf or sits stylishly on a living room coffee table."